Blanford's Foxes are a small species of fox. They have a body length between 40 and 50 cms (15.7 - 19.7 inches), a tail length between 33 and 41 cms (13 - 16 inches) and they weigh between 3 and 4 kgs (6.6 - 8.8 lbs). They are light tan or greyish in colour with a pale coloured underside. Their long, bushy tail has a black tip. They are solitary and active at night. 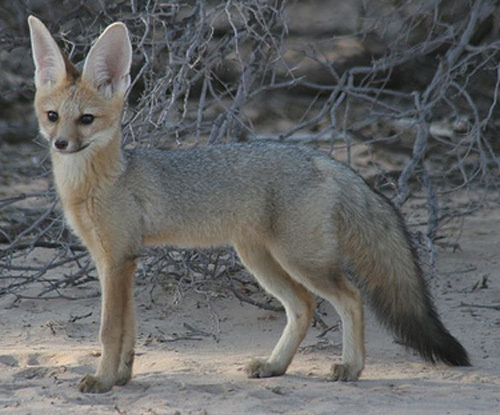 Blanford's Foxes are found in the semi-arid regions, steppes and mountains in west and south Asia. Blanford's Foxes mainly feed on fruit, such as melons and grapes, insects and rodents. After a gestation period of 51 - 53 days, Blanford's Foxes give birth to 1 - 3 cubs. At birth the cubs weigh between 50 and 100 g (1.8 - 3.5 oz). They are weaned by the time they reach 6 weeks old and reach sexual maturity at 8 - 12 months old. Humans are predators of Blanford's Foxes. There are no subspecies of Blanford's Fox. Please note: There are two entirely different species of fox called Hoary Fox (Lycalopex vetulus) and Corsac Fox (Vulpes corsac).